"My kids love these and so does my husband. It can be made with any ground meat and I serve it with sweet and sour sauce." Spoon about 1/2 teaspoon ground beef and 1/2 teaspoon Colby-Monterey Jack cheese onto the center of each wonton wrapper. Fold each wrapper into a triangle and seal edges together with water. Heat oil in a deep-fryer or large saucepan to 350 degrees F (175 degrees C). The vegetable oil will be ready when bubbles form around the end of a wooden spoon inserted in the oil. 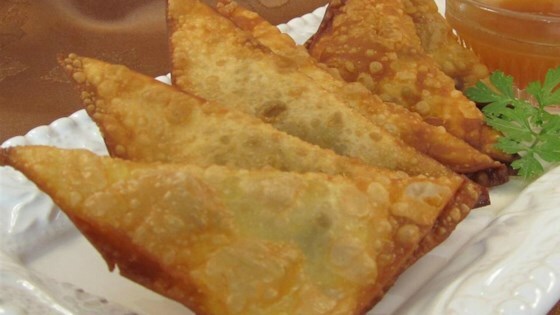 Fry wontons in the hot oil until golden brown, 2 to 3 minutes per side. Remove wontons with a slotted spoon and transfer to a paper towel-lined plate. Creative appetizer using Thanksgiving leftovers that will please a crowd. It was hard to taste the meat and cheese on the inside. I would try to add some seasoning to the meat next time. I used to make these often and serve as an appy. My guests loved them. They disappeared pronto and I could hardy make enough of them. Yummo! Quick and easy, and easy to adjust the filling based on how you like your cheeseburger. I read the reviews and decided to bake as a reviewer suggested, it seemed healthier. It tasted so great, I experimented with other shredded cheese. I loved them all.